If for you, like me, (nearly) a whole summer of warm weather and sunshine means an excuse to be in the kitchen experimenting with ice cream flavours, then no doubt you’ll end up with lots of leftover egg whites. Don’t throw them away – freeze in small plastic bags, labelled with the number of whites, then simply defrost as needed for your recipes (or keep in the fridge for up to a week). I remember once reading Nigella Lawson saying she sometimes separates eggs directly over the sink so she doesn't have the stress of figuring out what to do with all the leftover whites. Nigella, this one is for you. This is the easiest and most delicious way I know to use up leftover whites. 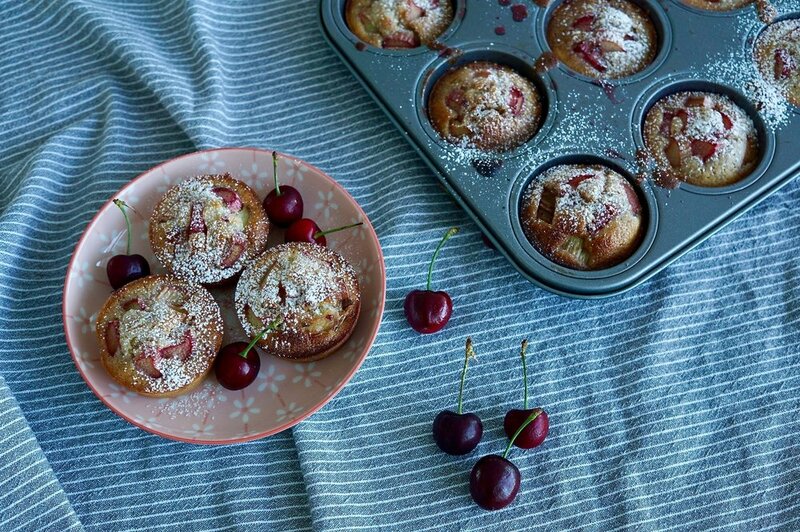 Five minutes of hands-on whisking time, a quarter of an hour or so in the oven, and you have a tray full of plump, almond-scented little cakes, bursting with ripe summer fruit. They are fudgy and sweet like marzipan, with a welcome sourness from the fruit pieces. You can use any fruit here, really, although my favourites are rhubarb, berries and apricots. Finish off these delightful little cakes by brushing them with a sweet, flavoursome syrup infused with Bird & Blend’s latest summer tea – Eton Mess. Simmering this fruity brew in sugar and water for a few minutes creates a gorgeous hot-pink syrup brimming with berry and cream flavours. 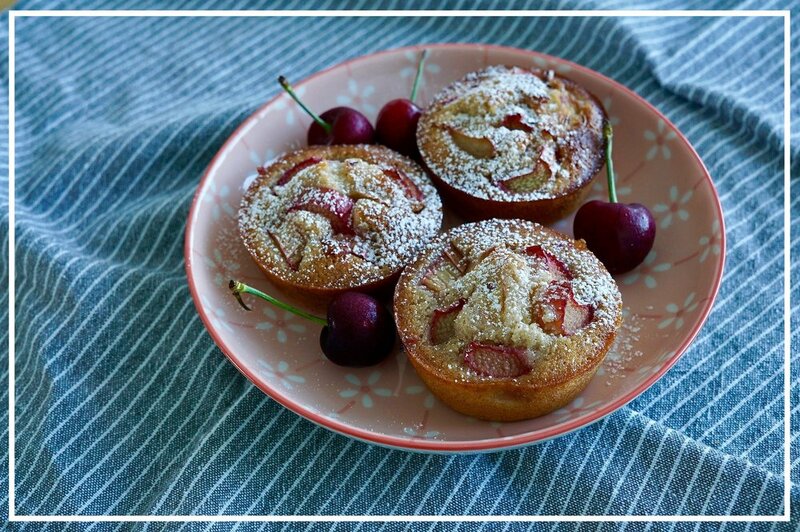 It’s perfect brushed over the hot cakes, fresh from the oven, where it sinks into the crumb and leaves them gooey, sticky, and tasting like summer’s finest dessert. You could, of course, use any tea in the syrup. I particularly like how Eton Mess leaves the cakes with a nice pink tinge to the crumb, but many fruit teas would have the same effect, or you could use a vanilla black tea, or even an Earl Grey. Pre-heat the oven to 200C. Grease a 12-hole muffin tin well with butter. In a large bowl, whisk the egg whites lightly with a hand whisk until frothy. Whisk in the caster sugar. Add the almonds, salt, almond extract and flour, then whisk again until just combined. Slowly pour in the melted butter, whisking continuously, until you have a thick batter. Divide the batter between the holes of the tin, then top each cake with a few pieces of fruit. Bake for 8 minutes, then lower the oven temperature to 160C and bake for another 5-10 minutes until the cakes are golden and a skewer inserted in the middle comes out clean. Meanwhile, make the syrup. Put the tea, water and sugar in a small saucepan and bring slowly to the boil, stirring. Lower the heat and simmer for 5 minutes or so until syrupy and pink. Remove from the heat and strain into a small bowl or jug. When the cakes are ready, brush them with the hot syrup while they are still in the tin. Leave to cool a little before removing to a wire rack. Leave to cool fully before eating.